Since last year I have been pressing Ontario for answers about if or when they will exercise their section 83 Criminal Code powers to legalize amateur MMA and other non-Olympic combat sports. The Ministry is seeking stakeholder feedback until December 8 and the formal regulations are expected shortly thereafter. 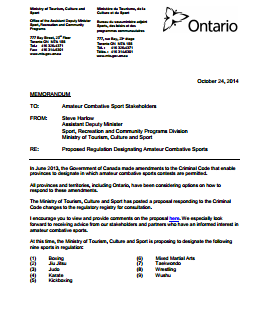 So it’s safe to say that with the publication of this letter from the provincial government that amateur MMA is currently illegal in Ontario and until they receive feedback from informed stakeholders current organisations putting on shows in Ontario right now could be putting people and this change at risk by breaking the law just to make a few bucks. Michael, thanks for your comment. You are correct that amateur MMA is currently illegal in Ontario as the proper framework does not yet exist for such events to comply with s. 83 of the Criminal Code.